Former WBC super featherweight champion Francisco ‘El Bandito’ Vargas (24-1-2, 17 KOs) will be taking a softer than usual fight against former Danny Garcia victim Rod Salka (24-4, 4 KOs) in a scheduled 12 round fight in the main event on ESPN on April 12 at the Fantasy Springs in Indio, California. Vargas fighting Salka isn’t a big deal. You can understand why Vargas would want a soft touch at this point in his career after what he’s gone through in his last three fights, but what’s difficult to understand is why this fight is in the main event on ESPN on April 12? Vargas-Salka isn’t a competitive fight on paper. It’s a mismatch, and it’s an ideal fight for boxing fans to see in a headliner if you ask me. The 35-year-old Salka is remembered as being the opponent for former 2 division world champion Danny Garcia four years ago in August 2014. Garcia knocked out the badly over-matched Salka in 2 rounds in a heavily criticized fight. Garcia had originally intended on defending his light welterweight title against Salka, who was picked out from the lightweight division instead of the 140lb. weight class. However, when the fight failed to be sanctioned as a title defense, Garcia instead fought Salka at a catch-weight of 142 lbs. The rationale at the time was Garcia needed an opponent to help him get acclimatized to the welterweight division. The only problem with that excuse was Salka was picked from the lightweight division. He was moving up two divisions to help Garcia get used to fighting at welterweight. Salka has turned his career around since his loss to Garcia. He’s won his last 5 fights against these guys: Jayro Duran, Justin Savi, Michal Dufek, Noel Echevarria and Monty Meza Clay. The only explanation that one can come up with to explain the 33-year-old Vargas fighting a non-contender like lightweight ‘Lightning’ Rod Salka is he’s been struggling as of late in three consecutive grueling fights against Stephen Smith, Miguel Berchelt and Orlando Salido. Vargas lost to Berchelt by an 11th round knockout last year in January. In Vargas’ fight before that, he was given a controversial 12 round draw against Oralndo Salido in June of 2016. If you saw that fight you’ll likely have concluded that Vargas was VERY fortunate to get a draw, as he appeared to lose to Salido by least four rounds. That should have been a clear for Salido. The thing that really jumped out at me was the punishment Vargas took in the Salido fight. That was a brutal beat down. 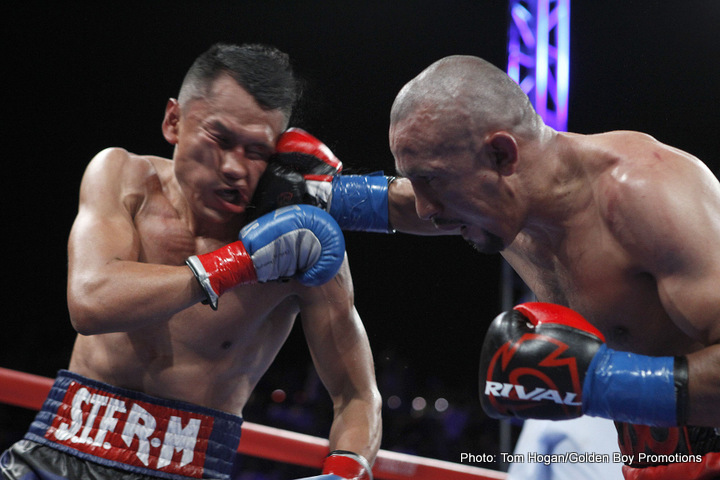 Vargas was battered for 12 rounds by Salido. The decision making by Vargas’ management to throw him in with Berchelt in his very next fight was obviously a mistake. That shouldn’t have happened if you ask me. In Vargas’ last fight, he stopped Stephen Smith in the 9th round last December. The fight was halted due a grotesque cut that the 32-year-old Smith suffered to his left ear. Despite getting the ‘W,’ Vargas took a lot of heavy shots from Smith. The fight was hardly a mismatch. The way that Vargas looked, he didn’t look ready to step up against any of the top super featherweights in the division anytime soon.